You never know what contaminants may be lurking in your drinking water. Because buying bottled water can become a burden to your budget, you need an easier and more affordable way to ensure that your tap or well water is safe to drink. With a faucet water filter, you can remove contaminants and know that you can use your water for drinking, brewing coffee, and other everyday tasks. Find the best faucet water filter for your home and budget by reviewing the top 10 choices available to you today. 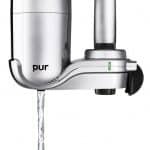 (Editor’s Overall Choice) – Pur’s 3-stage advanced faucet water filter has the powerful performance to remove more than 70 different contaminants from your water including lead, pesticides, and mercury. With its elegant chrome finish, it makes a visually appealing addition to any sink on which you install it. It also is compatible with most standard faucets found in homes today. The PUR 3-stage advanced faucet water filter also comes with an electronic indicator that tells you when it is time to change the filter. It features a simple one-click installation design and also swivels 360 degrees for easy use. 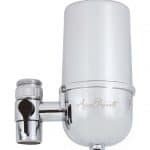 The major drawback of the PUR 3-stage advanced faucet water filter is that it cannot be installed on pull-out or handheld faucets like those you would use in the shower. It also only comes with one filter, meaning that you must buy additional filters, which can drive up your costs for the PUR 3-stage advanced water filter. It likewise does not come with the batteries that you need for the electronic filter indicator. As a final verdict, the PUR 3-stage advanced faucet water filter is a solid choice for people who want o remove as many contaminants from their water as possible. This could be the ideal solution to improve well water or water that has tested for high levels of lead, mercury, and other toxins. 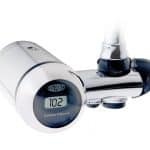 It may not be ideal for people who want to keep their initial costs low or prefer one that they can use with handheld faucets. 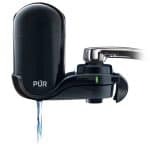 (Editor’s Budget Choice) – People who need to save money when buying the best faucet water filter for their homes may find PUR’s black basic vertical faucet mount to be the ideal choice. 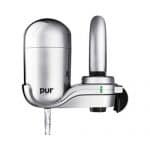 Priced under $20, this faucet water filter comes with the PUR brand guarantee to remove contaminants effectively and provide up to two months’ worth of toxin-free water. The filter actually is designed to remove 61 different contaminants like mercury, lead, pesticides, and more from a home’s water source and can filter up to 100 gallons of water before the filter itself needs to be changed. When it is time to change the filter, the black basic vertical faucet mount’s indicator will light up and remain illuminated until the old filter is replaced. The mount installs with one click, allowing owners to add it quickly to their faucets without having to use tools like a drill or screwdriver. The major drawback of the PUR black basic vertical faucet mount is that it only comes with a single filter, which means that despite the initial low price people must spend a bit more money if they want more than one filter when they first buy this model. It also does not come with a courtesy set of batteries for the indicator light. The final verdict on the PUR basic black vertical faucet mount is that it is a great choice for shoppers on a budget who want to filter their homes’ water without a big upfront investment. It may not be ideal for people who prefer models with extra filters or the courtesy of at least one set of batteries for the electronic indicator light. (Editor’s Premium Choice) – DuPont has established itself as a brand associated with top quality home fixtures and appliances. It does the brand and its reputation proud with its WFFM350XCH deluxe faucet water filter mount. This faucet mount comes with an electric meter that helps it filter 200 gallons of water before the filter must be changed. The easy-to-read display shows you how many gallons have been filtered and how much longer you have until the filter must be replaced. The faucet mount also features high performance filtration technology that leaves even the most compromised of water clean and free from odors. It has the capability of removing harmful and dangerous toxins like chlorine, lindane, asbestos, mercury, and lead as well as sediment that could find its way into your home’s water. 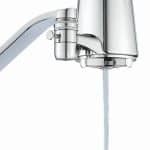 The major drawback of the DuPont WFFM350XCH faucet water mount is that it comes with a price tag that is notably higher than other comparable water filters on the market. It also only comes with one filter and no batteries for its electronic function. You must purchase additional batteries and filters separately. As a final verdict, the DuPont WFFM350XCH deluxe faucet water mount is the perfect choice for people who want the convenience of using a high-tech water filter in their homes. It may not be a great selection for people on a tight budget who cannot afford a pricier upfront investment for their home’s water filter. The Brondell H20 + Coral UC100 single stage under counter water filter system comes with its own LED faucet as well as a high-performance one-stage carbon block that removes 99 percent of lead and other contaminants found in water sources today. It is WGA Gold Seal certified and features a simple twist and turn installation design. It can also filter upwards of 100 gallons of water before the filter must be replaced. Along with lead, this under the counter system is great for removing toxins like cysts, mercury, pesticides, and other contaminants that can be found in city, county, and well water. The major drawback of the Brondell H20 + Coral UC100 single stage under counter water filter system is that it despite being designed to fit easily under the counter some people have found that they must use different size adapters to complete the installation of the system. Because the system comes with its own faucet, the overall price is higher than the purchase of a faucet mount or filter itself. The final verdict for the Brondell H20 + Coral UC100 single stage under counter water filter system is that it is a solid choice for people who want the convenience of a combined faucet and filter system. It may not be perfect for people who prefer to use the faucets already installed in their homes or those who are shopping on a lower budget. 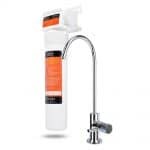 PUR’s advanced FM-3700B faucet water filter is guaranteed to remove 70+ different toxins from a home’s water supply, giving the water a crisp, clear, and odor free taste that rivals the taste and quality of mineral water that you can buy in stores. The filter comes with its own LED indicator light that signals when it is time to change out the filter. It also is priced affordably so people on the tightest of budgets can buy it easily. The filter also can fit most standard kitchen faucets and features an easy-to-install design. A single filter can clean up to 100 gallons of water. It comes in an appealing chrome finish that goes great with any kitchen décor. The major drawback of the PUR advanced FM-3700B faucet water filter is that it does not come with additional filters. It comes with a single filter that can be used to clean up to 100 gallons of water. After that, users must buy new filters separately. The filter also does not come with a set of batteries, which also must be bought separately before the filter can be used. The final verdict for PUR’s advanced FM-3700B faucet water filter is that is a great choice for people who want the quality and taste of mineral water without actually having to buy the water from stores. It may not be ideal for people who cannot afford or prefer not to buy extra filters and batteries when first purchasing the filter. Culligan has made a name for itself a top seller of clean and safe drinking water. When you want to save yourself the expense of buying Culligan’s bottled water, however, you can enjoy the same quality of water in your home with Culligan’s FM-25 faucet mount filter. Priced under the $50 mark, the filter removes toxins like lead as well as odors that give your water a bad taste. It comes in an appealing chrome finish and is easy to install without having to use hand tools. It also comes with a two-year warranty for your convenience. 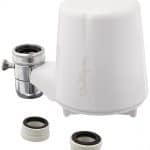 The major drawback of the Culligan FM-25 faucet mount filter is that some people report the mount breaking or sustaining damage after prolonged use. The cracks and damages are not covered by the warranty. Other people say that the filter did not last as long as promised and had to be replaced before it reached the 200 gallon limit. The final verdict is that the Culligan FM-25 faucet mount filter can be a great choice for people who are fans of the Culligan brand and want safe drinking water without having to buy bottled water separately for their homes. The filter may not be ideal for people who want a sturdier design or a filter that can be used for years without cracking or breaking. Brita has become a household name in the faucet water filter market and a brand that more people are growing to trust with making their homes’ water safer to drink. 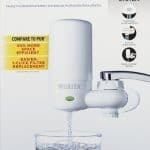 The On Tap faucet water filter system from Brita comes with everyone people need to get started right away filtering their water for better safe and higher quality. Unlike many home filtering systems, the Brita On Tap comes with two filters. It also is easy to install and is compatible with most modern kitchen faucets found in homes today. The major drawback of the Brita On Tap faucet water filter system is that it can fall off the faucet if the water pressure is too high or the faucet itself is not kept clean. The filters also may not last as long as promised and have to be replaced more often than stated on the box. The final verdict is that the Brita On Tap is a great choice for people who want an affordable and simple to use water filter system in their homes. It may not be perfect for people who want to install the system and forget about having to maintain it because it continuously slides off the faucet. The Aqua Elegante advanced tap water faucet filter is recognized for being one of the best filter systems for removing chlorine and other contaminants that create bad odors in drinking water. Along with removing chlorine, however, it also removes toxins like cysts, asbestos, and benzene as well as others that could cause people to become sick. Additionally, the Aqua Elegante advanced tap water faucet filter is easy to install and can effectively filter up to 200 gallons of water. The money-back guarantee promises that a single filter should last at least four months. It comes in a sleek chrome finish that complements any style of kitchen. The major drawback of the Aqua Elegante advanced tap water faucet filter is that it is not capable of removing fluoride from a water supply. It also can spray water if it is not properly installed, which some users have noted as being more difficult than outlined on the packaging. 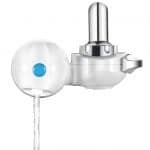 The final verdict on the Aqua Elegante advanced tap water faucet filter is that is a great selection for anyone who wants a high-performance filtering system that comes with a money-back guarantee. It may not be ideal for people who want fluoride-free water or those who lack the talent or capability of installing it so that it will not spray water when used. The ICOCO 6 stage ceramic faucet water tap is designed to remove contaminants like rust, chlorine, and other toxins from a home’s supply of drinking water. With its simple twist-on installation, this filter is compatible with most modern kitchen faucets. It also is made to last upwards of six months and filter up to 580 gallons of water with a single filter. It also is designed to save space with its compact dimensions. It likewise can match any style of kitchen with its ceramic finish. It comes with an extra filter for your convenience. The major drawback of the ICOCO 6 stage ceramic faucet water tap is that it is heavier than other faucet mounts on the market today. It also can fall off the faucet or cause water to spray everywhere with improper installation. It likewise cannot be used on handheld or pull-out faucets. The final verdict for the ICOCO 6 stage ceramic faucet water tap is that it is an affordable filtering choice for people who like the look and finish of ceramic. It is not a great choice for people who want a filter that fits with handheld or pull-out faucets or one that fits better without sliding off the faucet. Culligan’s FM-15A advanced filter kit is designed for simple installation and convenient use without the expense of more complex and difficult to use filters. This kit comes with everything you need for fast installation in your kitchen. It accommodates most modern kitchen faucet designs and comes in a sleek white color that should match any style of kitchen well. The kit also removes toxins like chlorine, lead, mercury, and farm pesticides, leaving water clean and odor-free. It is priced under $40 and guaranteed to last for months. The major drawback of the Culligan FM-15A advanced filter kit is that it only comes with a single filter. Some users have also said that the water can have a bad taste even after going through the filter. The final verdict for the Culligan FM-15A advanced filter kit is that is a solid choice for people on a tight budget who want to filter their water for toxins that could make them sick or cause bad odors. It is not a wise choice for anyone who wants more than one filter or has a sensitive palate that picks up on lingering bad tastes in water. With the wide variety of faucet water filters on the market today, you may wonder how you can be sure that you are getting a model that will give you the filtering results you want and provide you with fresh, clean, and safe drinking water. Before you shop for a faucet water filter, you should keep these important criteria in mind. Price tends to be one of the most important aspects of shopping for a faucet water filter that you can enjoy using in your home. You can find these filters in a wide array of price ranges today. The higher priced ones tend to be made by brands like DuPont or PUR. Some of the more expensive filters or filtering systems also come with hardware like LED faucets included with them. That is not to say that the lower price filters are of lesser quality or come without the hardware you need to use it right away in your kitchen. You can find moderately priced filters that offer you the same level of quality and performance that you want when filtering your drinking water. Nonetheless, before you shop for one of these filters, you should have a set budget in mind and use that price point to guide you in choosing a faucet water filter that you can afford and one that will give you the drinking water results you want. Another factor to take into consideration involves how big of a filter or filtering kit you want for your kitchen. You can find mounts that are very compact and sleek with their designs. You can also find larger kits that take up a bit more space in your sink after they are installed. You can even choose filtering systems that must be installed under your sink, thus keeping the entire filter out of sight in your kitchen. Depending on how much space you have and for what purposes you use your kitchen sink most often, you may think about how big of a filter you actually want. If you do not have a dishwasher, for example, and must wash your dishes in the sink, you may not want a filter that gets in your way as you wash and rinse your dishes. However, if you rent your home and cannot install a new faucet or under counter system or you do not have a lot of under counter space, you may need a filter that is bulkier but can still give you the filtering results you want. You should decide the size of the filter before shop for the most model for your kitchen. While perhaps not the foremost consideration, you may also want to think about the appearance of the filter you choose for your kitchen. Do you want one that blends in with your existing hardware or are you on the lookout for one that can add visual appeal to your kitchen? You can find faucet water filters in finishes from stainless steel to ceramic. Stainless steel filters arguably tend to blend in better with existing hardware found in most homes. Ceramic and chrome tend to be more elegant finishes that can give your kitchen an upgraded look. You can also find filter mounts that come in a basic black finish that should blend into your kitchen’s background. The faucet water filters today are designed to be visually appealing regardless of the kind you choose. You can narrow your choices by deciding what kind of finish would go best in your kitchen. Most of the faucet water filters available today are designed to fit with standard kitchen faucets. You can typically find one that you can take home, install easily, and start using right away. However, in some cases, people may prefer a filter that they can use on specialty faucets like handheld or pull-out models that you use in vegetable sinks, handicapped showers, and elsewhere. If you want a filter that you can fit on these kinds of faucets, you may need to look beyond your local hardware or big box store. You may have to order one of those filters online. However, if you would be well served by a filter that accommodates standard kitchen faucets, you are in luck wherever you choose to shop. Most of the models today are compatible with standard faucets found in homes today. Despite counties and cities filtering their own sources of drinking water, they may be unable to provide you with the highest quality and safest water for your home. Rather than spend money on bottled drinking water or risk your health drinking the water from your tap, you can remove even more contaminants like lead, mercury, and pesticides by using a faucet water filter. The filters available to you today are easy to install and can give you better tasting and odor-free water that you can use to drink, brew coffee with, and use for other household purposes. The filters on the market tend to be priced affordably and come in a variety of sizes and models.